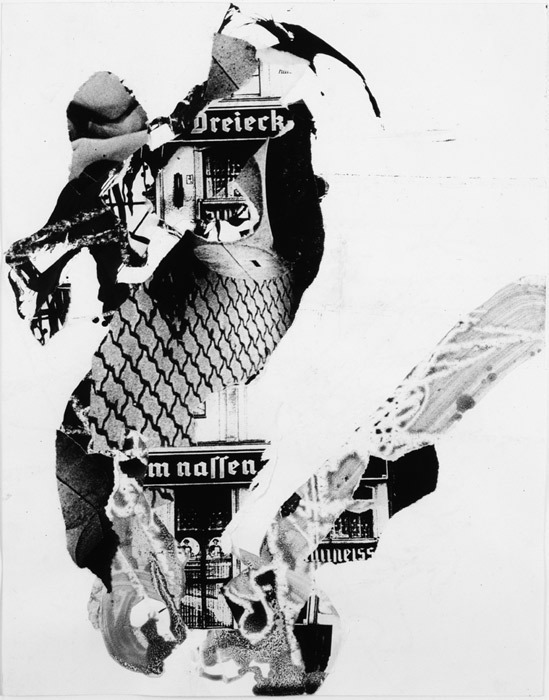 Charline von Heyl, untitled (detail), 2003, photocopy, collage, and ink on paper, fifteen elements, each 24 x 19". In the run-up to what promises to be a marathon year for Charline von Heyl (a major survey of her work is currently on view at the Tate Liverpool), a recent exhibition of a decade’s worth of her paintings and works on paper at the Philadelphia ICA gave visitors a sampling of what is surely one of the more challenging, complexand enjoyablebodies of contemporary abstract painting. For von Heyl, painting is as alive as ever; it is the medium’s fecundity in the here and now that interests her most. If the burden of modernism is at issue in her work, it is as a storehouse of pictorial tactics, no longer a nightmarenot even a burden. Equivocation and self-sabotage are the motivating forces of von Heyl’s practice, which proceeds as a two-step of gesture and counter-gesture, each maneuver feeding on the previous one without negating it.